You are staying on an Island - your small world which is the only thing you care about. You want to live there peacefully but you have made enemies (too many). So, they are going to attack your Island. How long can you protect it? Enjoy the game! Let's see how good a Island Guard you are. The Ludum Dare entry is here. 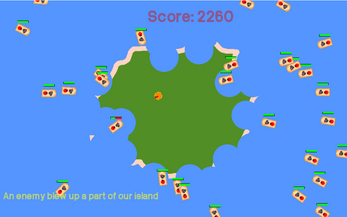 Game made with C++ and SFML library. Just download the archive, extract it and run "Island Guard.exe"!